The Conference and Workshop on Neural Information Processing Systems (NIPS) is probably the biggest conference with machine learning / deep learning as a main topic. This year, about 6000 people attended it. My friend Marvin and me were supported by Begabtenstiftung Informatik Karlsruhe. The complete program can be found in the Conference Book, but I would like to point out some of my highlights. Generative Adverserial Networks (short: GANs) were one hot topic at NIPS. The idea is to train two networks: A generator \(G\) and a discriminator \(D\). The generator creates content (e.g. images) and the discriminator has to decide if the content is of the natural distribution (the training set) or made by the generator. InfoGAN: Get more control about properties of the generated content. Combinding deep learning with graphical models like CRFs / Markov Random Fields has been done for semantic segmentation for a while now. 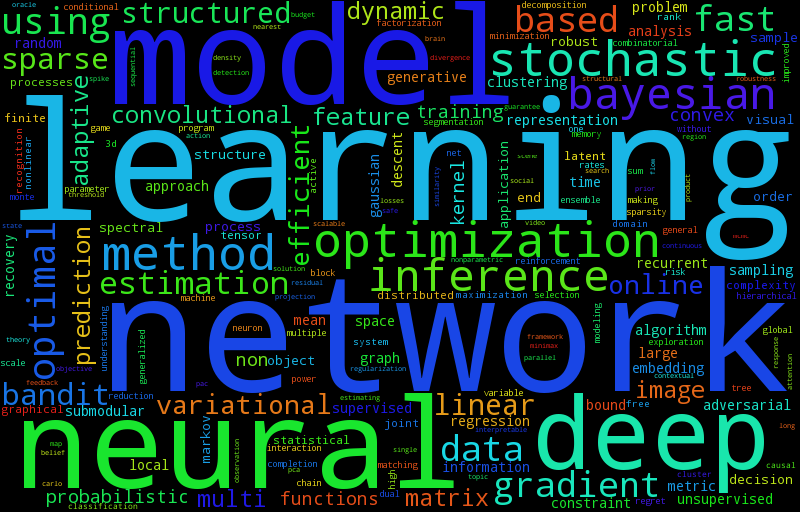 It seems like the combination of those two is called "bayesian deep learning". If you look for the keyword "variational" it seems to belong in this category. I don't really know this area, so I leav it to Eric Jang to point out important papers. Andrew Ng gave a talk in which he summarized what he thinks are some of the most important topics when training machine learning systems. Most of it is probably also in his book Machine Learning Yearning or in his Coursera course. When you design a speech recognition system, you can measure 3 types of errors: Human error, training set error and test set error. The difference between the human error and the training error is "avoidable error" (bias), the difference between training and test error is "variance". Human level performance is ambiguous: In a medical application, is an amateur, a doctor, an experienced doctor or a team of (experienced) doctors the "human level performance"? Role of an "AI Product Manager"
Layer Normalization: An successor for Batch Normalization? Universal Correspondence Network: Find semantically meaningful similar points in two images. For example, to frontal images of different humans, where the network finds eyes, nose, chin, lips in both images. Bring a camera: The information comes very fast. Too fast to take notes, but you can shoot a photo of the slides. In fact, quite a lot of people do so. Shoot a photo of the first slide, so that you know what the talk was about when you look at your slides. ... let the first slide be there long enough, so that people can take a photo of it. ... answer key questions: (1) Which problem did you tackle? (2) How did you test your results? (3) To what is your "solution" similar? salon-des-refuses.org should contain papers which were refused, but are also of high quality. However, the website seems to be down.